We will be dealing with two types of waistlines this week and next – one is where the skirt will be joined to a bodice to make a dress, and the second type will be in making a skirt or pair of slacks. Before any waistline seam is sewn, all darts, tucks or pleats must be made in the skirt, and if attaching to a bodice, all vertical seams and darts must be finished and pressed. Turn the skirt to the wrong side and the bodice to the right side. 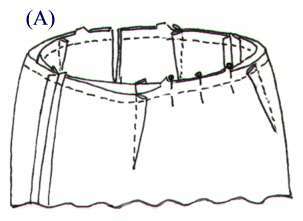 Place the bodice into the skirt so that the right sides are together (A). Line up the side seams, center front and back, and all notches and pin in place. The skirt may be slightly larger than the bodice, which will be eased into the seams. Stitch the waistline seam (B) from the zipper placket edge around to the other zipper placket edge. The machine stitching will be done from the inside, taking care not to twist the darts as you sew. Secure the stitching at the beginning and ending with a reverse stitch. Remove the pins and any basting threads you may have used. Press the seam as stitched (C), and finish the seam with a zig zag stitching around the waistline. Pull the bodice out of the skirt and press the seam again, with both seam allowances directed toward the skirt. These “how to” tutorials are an excerpt from our book “Basic Clothing Construction”. This book is a handy addition to have in your sewing room, so you can refer to the various sewing tips and tutorials at any time. Thank you so much for posting your sewing information on line. I want to thank you for the free book. I am going to learn a lot from your sewing business.